Just across the street from Viretta Park sits a house that once belonged to legendary grunge rocker Kurt Cobain of Nirvana. On April 8, 1994 Kurt Cobain took his own life. An employee discovered his body in the spare room above the garage. Some say his death may have been murder and not suicide. 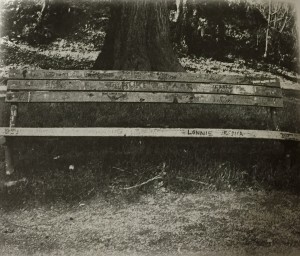 It is believed that before his death Kurt spent most of his remaining days sitting on a bench just outside his house. Maybe that’s where he planned his last moments. Whether or not it’s true, people say that they can feel his presence near the bench. Others say they have seen him just sitting there, reliving his last few hours. Some have even reported feeling him breathe on them or touch them. In fact, there have been reports of his face appearing in the window of his former home, and the new owners say that during thunderstorms, they can hear whispers from the former rock star himself. If you visit the site, you’ll find a bench filled with flowers and cards and writings from fans who miss his inspirational talents. The city parks department must replace the boards on the bench every so often due to the graffiti left by fans. One man believes he has obtained the original boards that Kurt himself sat on just before the tragic event. After collecting these boards and placing them on his property, the man immediately began encountering strange things. He felt a chilling breeze shoot right past him, as if someone had run by him. He’s heard odd noises and felt a presence, and he believes that Kurt’s spirit might be attached to these boards. Many believe that the spirit of one who commits suicide remains earthbound, due to its troubled state of mind at the time of death. So perhaps Kurt’s ghost lingers as one of those hurting souls who may have regrets. Ross Allison is the author of Spooked in Seattle. In his book he takes readers on a hair-raising ride through Seattle’s neighborhoods. Ross is the founder of A.G.H.O.S.T., one of the oldest, active paranormal investigation teams in Washington State.